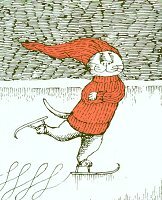 This whimsical cat Christmas card features a drawing by Edward Gorey. The card is 5" x 7". Inside greeting: Season's Greetings. Envelope included.